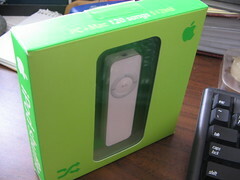 I did two major (to me) Mac-related things recently: I upgraded to OS X 10.3.9, and I got a 512MB iPod Shuffle. Yeah, I’m cheap. It’s been three and a half years since the iBook’s tumultuous arrival, and it continues to serve me faithfully, chugging along with its 384 MB of RAM, a bit battered and worn with age, but still working pretty well. 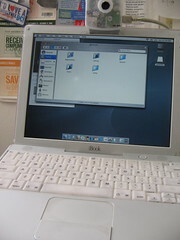 I contemplated trading up to a G4 (or, more recently, an Intel MacBook), but this iBook has sentimental value to me, having been my first Mac, the machine which helped me get my Master’s Degree, and it still runs fine, so I’ve opted not to sell it. Today the iBook sits on its iCurve beside the Netvista, running as a webcam server and music player — and I still bring it with me when I go on trips. All this time it’s been running OS X 10.2 “Jaguar,” but I figured if I was going to keep it, I had better upgrade, since Jaguar seems to have almost completely lapsed into obsolescence in the Mac software world. A G3/700 with only 384MB of RAM probably would have trouble handling OS X 10.4 “Tiger”, so I opted for 10.3 “Panther,” which came relatively cheap secondhand on eBay. No mercy: I wiped the HDD completely after a quick backup. (I didn’t even bother to keep my old email.) OS X 10.3 installed quickly, and just as quickly ran software update to get up to 10.3.9. Since I named the Netvista “Fezzik,” for being a huge, hulking brute, I renamed the iBook “Vizzini,” after the proud Sicilian intellectual who met his untimely death in a poisonous mind game with the Dread Pirate Roberts. I will talk about the iPod Shuffle at length in another post. Aha! I caught the Princess Bride reference! Supposedly the higher the version of OS X the faster any Mac will run. Supposedly.